Everyone knows how to make Easter nests, don’t they. You crush up some Shredded Wheat, add some melted chocolate, and you’re pretty much done. Today’s recipe doesn’t mess with perfection too much, and instead just adds some peanut butter into the mix, as well as some beautiful golden caramel eggs. Salty, sweet, and pretty as hell. 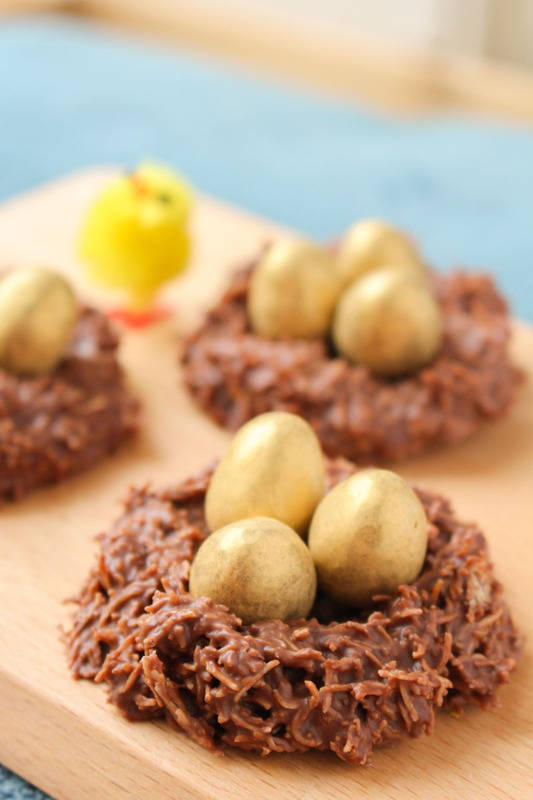 I always make Shredded Wheat nests this time of year. It’s my Easter tradition (along with easting as much chocolate as humanly possible for breakfast on Easter Sunday). But this time around I wanted to make them a little bit special, so I added some peanut butter flavoured candy melts to the chocolate before I melted it. I’ve gone for a ratio of 1/2 milk chocolate to 1/2 peanut butter melts here, but feel free to increase or decrease to whatever you feel like. I feel like the addition of the salty peanut butter melts makes these nests a little bit more grown up, but they would still be perfect to make with kids. As long as you don’t mind melted chocolate everywhere. Who am I kidding? I’m 28 and the kitchen looks like a chocolate bomb has gone off in there. The golden eggs are made by Galaxy, and you can find them in UK supermarkets (and maybe elsewhere? I don’t know). They are so pretty, with an edible gold coating on the outside, and a delicious chocolate and caramel filling that works really well with these peanut butter nests. No, I don’t work for Galaxy (I wish) – I just think these eggs are awesome! 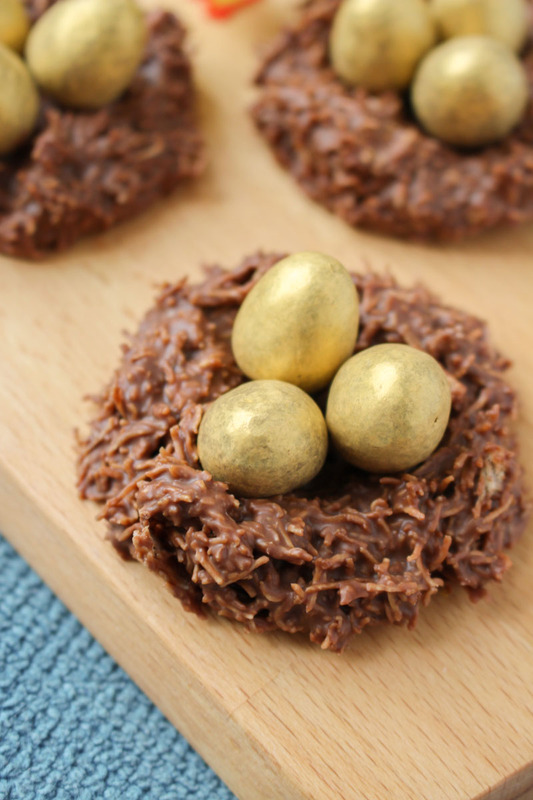 If you can’t get hold of these golden eggs, then Mini Eggs are always a great choice. And if you want to make these nests gluten-free, then replace the Shredded Wheat with a gluten-free alternative, like rice pops. They won’t look as twiggy, but they will taste just as great. 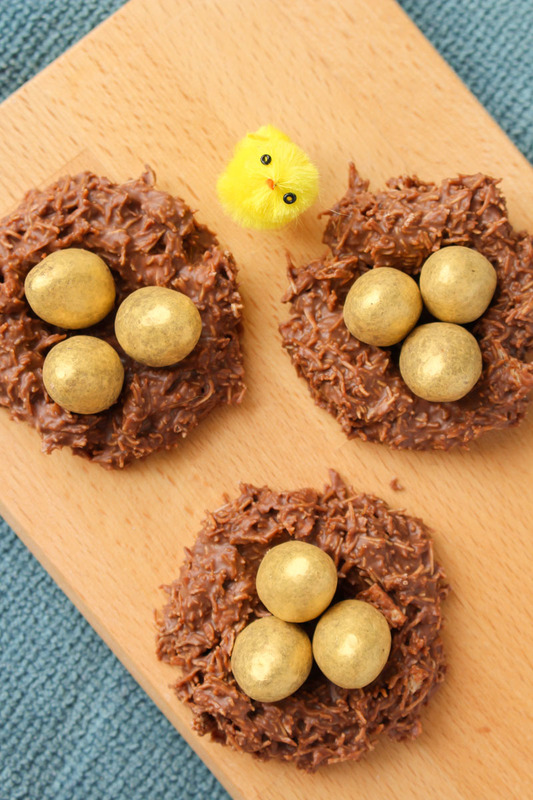 Adorable little chocolate and peanut butter Easter nests, filled with golden caramel eggs. Melt the chocolate and peanut butter melts in a saucepan over a pan of boiling water, or in the microwave. If using the microwave, make sure to stir every 30 seconds to avoid burning the chocolate. Once melted, stir in the salt and set aside. In a large mixing bowl, break apart the shredded wheat, so that it looks like the individual twigs of a nest. Make sure any lumps from the edges of the shredded wheat are broken apart too. Add the melted chocolate and peanut butter mixture, and mix well using a spoon until the shredded wheat is completely coated. Cover a baking tray with baking parchment or greaseproof paper, and spoon mounds of the chocolatey shredded wheat mixture onto it. Form the mounds into nest shapes using your hands or a teaspoon. Press three golden or mini eggs into the centre of each nest. Place the nests in the fridge to cool for an hour or so. The nests will keep for up to a week if stored in an air-tight container. There is no need to store in the fridge. They can be frozen for 2-3 months. These are so cute. What a great flavour. Thanks Lucy 🙂 Peanut butter and chocolate is so the best!